I'm a big fan of jams and jellies, although I don't eat them that often since I don't usually eat breakfast. This means that I have a habit of buying jars of jelly that end up expiring at the back of a shelf. Recently, however, I'm making more of an effort to try things soon after I buy them instead of buying them and then forgetting about them. 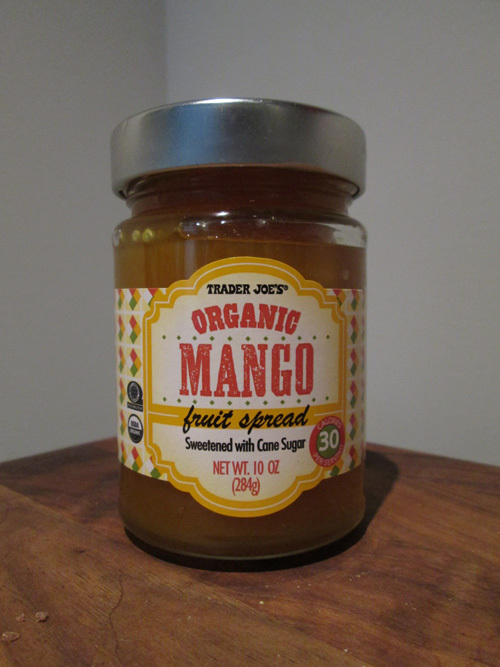 The latest Trader Joe's jelly/jam/fruit spread I discovered was the recently launched Organic Mango Fruit Spread, which arrived right at the end of Mango Madness season at TJ's. I tried this on the Lavash Bread rather than toast, and I think it's pretty great. Let's start with the texture. 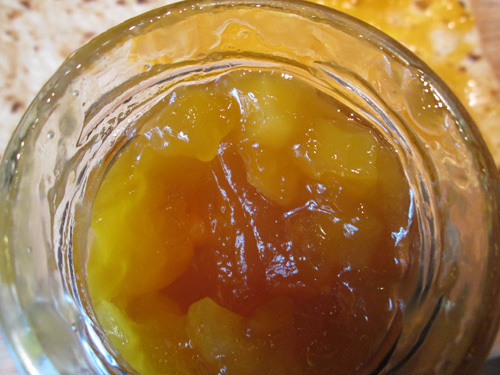 Unlike some jellies/jams/fruit spreads, this one doesn't have a firm, somewhat-difficult-to-spread consistency. It's not runny, but it's super easy to spread without any real effort. 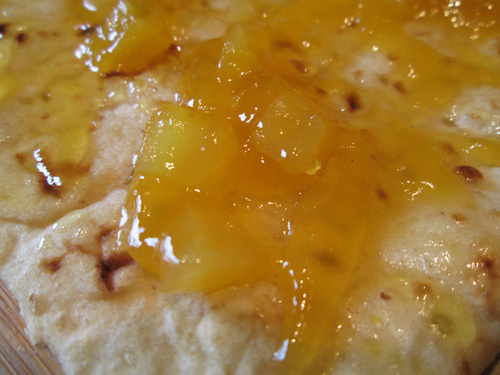 The fruit spread also has small chunks of mango throughout, which you can see in the photos below. As for the flavor, it's definitely super mango-y (as it should be). 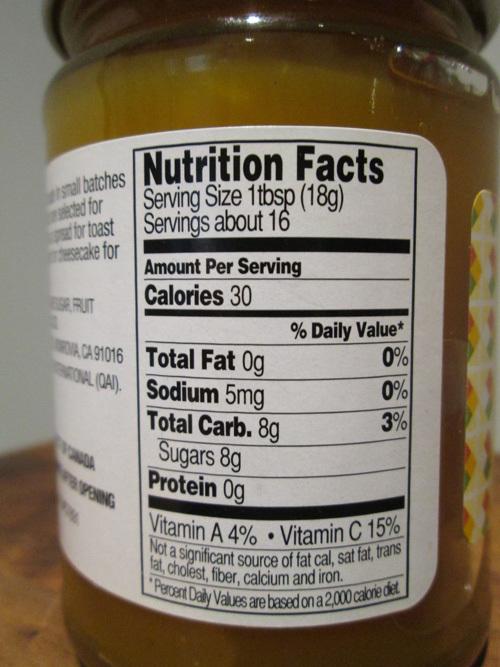 There's sugar added to bump up the sweetness, but it doesn't overpower the flavor of the natural mango flavor, which I find is a problem sometimes with fruit spreads. Even though this is obviously meant to be mostly eaten on toast, I think this could actually be pretty versatile. It could easily be put on ice cream, used as a glaze for chicken or pork, mixed with cream cheese as a dip, used in a layer cake in place of icing on the inside, or eaten with TJ's Coconut Pancakes for a tropical breakfast dish. It usually takes me a pretty long time to get through a whole jar of fruit spread, but if it's still available when I eventually run out, I'd say I'll definitely add it to my shopping list again.